It's a known fact that the way to a traveller's heart is through his stomach. At least, that’s how Andrew Allen fell in love with the countries he visited on his Busabout Ottoman Trek. Here, he reminisces over the tantalising tastes of his tour. Disclaimer: this post will cause a mouth-watering sensation and an immediate desire to travel. I’ve never met a traveller who doesn’t love food. Expanding your horizons and stretching your taste palette go hand in hand. Busabout’s Ottoman Trek takes you away from the usual tourist track, overland through five countries from Croatia to Istanbul. Going in, I had no idea what was in store for my taste buds, as (besides Turkish kebabs) I knew nothing about what Croatian, Bosnian, Serbian, Bulgarian or Turkish families serve up for dinner. This is what the Ottoman Trek tastes like. Seafood is a big part of any Croatian menu, and much of Croatia’s coastal cuisine is noted for being organic. Croatian food is also heavily influenced by its Italian neighbours. 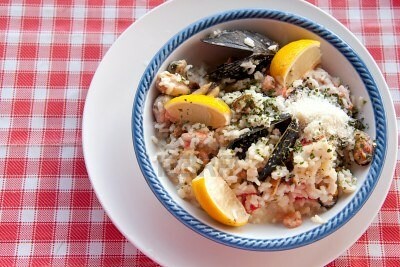 The restaurants in Split smelled so good that I was chowing down a seafood risotto at 11am. 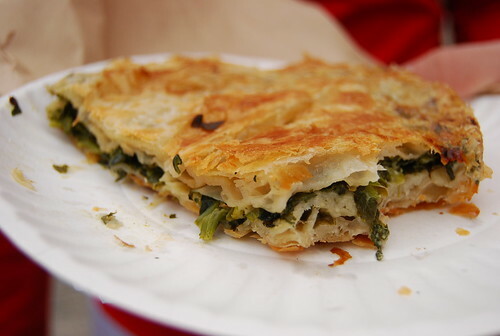 Burek are tasty little pastry straws filled with meat, potato or cheese. They’re rolled into a large spiral and then sliced and served in wedges like pizza. They’re not too oily and after you crunch down on the pastry it melts in your mouth. We sat in the old town admiring the beautiful Mostar Bridge and devoured several each. It’s probably the most food I’ve ever demolished for €1! It’s not easy to be a vegetarian in Bosnia – they love their meat. Our three course Bosnian dinner at a family-run restaurant served meat in all sorts of ways – my favourite variety were stuffed inside small peppers, accompanied by meatballs and sausages. The following night we also discovered a staple Balkan food, ćevapi, at a tiny basic-looking eatery. Up to a dozen small peppery sausages served inside a pita with onion, herb sauces, and even chips! Excellent hangover food, and ridiculously cheap. Most of the Balkan countries consider rakia their natural drink, however it’s Serbia where we Ottoman Trekkers were first introduced to this pungent shot of fermented fruit. It tastes like drinking your dad’s cologne, and sets your mouth on fire. 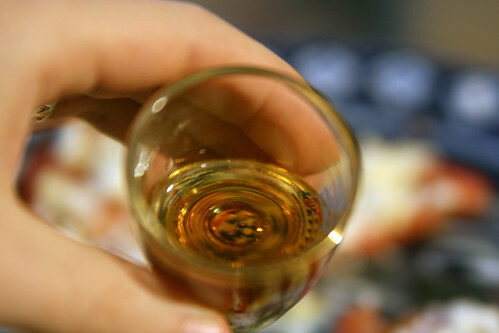 But rakia is such a part of Balkan life that you’d be crazy not to try it. 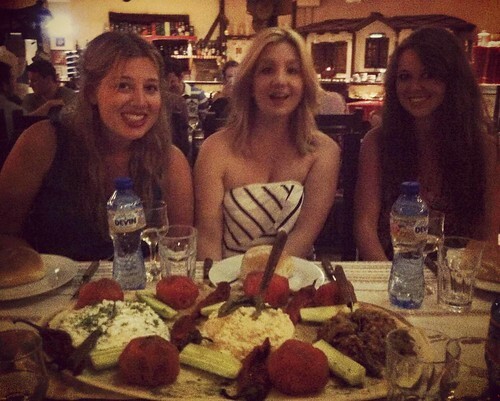 The gypsy feast in Sofia was by far the most memorable meal of the Ottoman Trek. First, you sample chewy breads with roasted peeled tomatoes and dips that taste like hummus and ratatouille. Then, a huge serving of sausages and lamb mince patties is delivered to every table. The centrepiece is an enormous loaf of unsliced white bread. A hole has been cut through the centre and a large wooden spoon balanced in it, with two fist-sized peppers hanging from the spoon. The peppers are so fresh that their skin explodes as you bite into them. 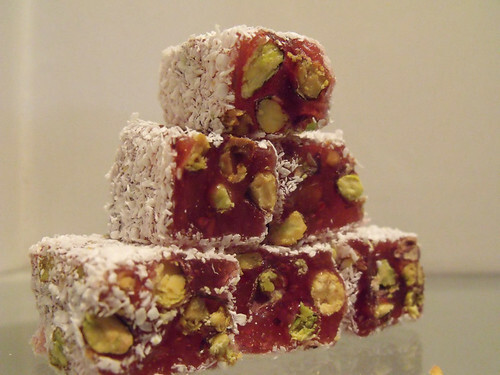 I always thought of Turkish delight as small powdery cubes that taste like perfume, and I thought baklava only came in one flavour. I was proven wrong within seconds of entering the Grand Bazaar in Istanbul, when a large chunk of crimson Turkish delight filled with crushed green nuts was thrust into my hand. It was far chewier than the rosewater variety, and the taste was arresting. ‘What flavour is it?’ I asked after devouring it. ‘Pistachio and pomegranate’, I was informed. I bought an entire box. Turkish delight with a twist. To read more about Andrew’s Ottoman Trek, see his daily Trek snapshots and comic adventures in an Istanbul bathhouse. Follow @antipodeanblog on Twitter for live updates from the road. To sample the tastes of the Ottoman for yourself, call our consultants on 0208 045 4186.